Vanguard Plus 5 (Zoetis) vaccine aids in the prevention of canine distemper, adenovirus type 2, parainfluenza, parvovirus. For vaccination of puppies 6 weeks of age or older. 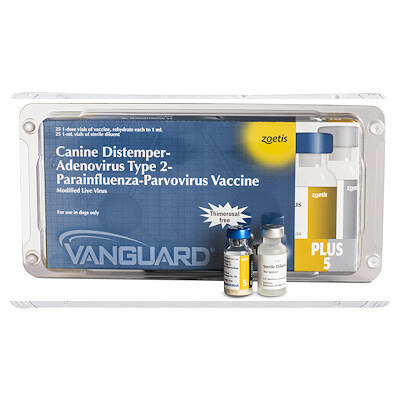 The Plus in Vanguard Plus 5 vaccine refers to the high-titer, low-passage canine parvovirus (CPV) component, which provides added immunogenicity that can override appreciable levels of maternal Parvo antibodies in puppies 6 weeks of age or older. Give 1 ml dose Subq or IM at 6 weeks of age and 2 more doses 3 weeks apart. Annual single dose booster reccomended. Syringes and needles not included, order as needed.